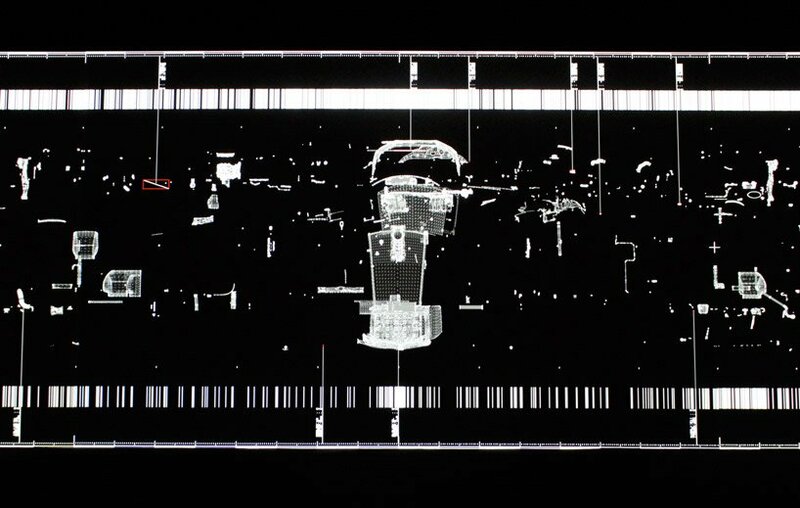 japanese artist ryoji ikeda has developed a digitized installation entitled ‘data.anatomy [civic]’ which has been formed from the entirety of the data set belonging to the latest model of honda‘s civic. detailed instructions for the building of this automobile were given to ikeda by mitsuru kariya, the project leader for the civic’s construction. the pair conducted a series of meetings to discuss the release of uncensored and previously unseen data in the form of an abstracted installation of light and sound by ikeda. the aesthetic experience offered by ikeda is built from his abstraction of the initial intricacy present in the makeup of the vehicle. the artist notes, ‘a civic consists of thousands and thousands of tiny, tiny parts, but I saw a certain beauty in that. it’s like a human– there are so many organs in it– and that inspired me. my installation will reveal the richness and beauty of the ephemeral concepts that are embodied physically in the car itself‘. in ikeda’s reinterpretation of kariya and his team’s civic construction data, three-dimensional sketches picturing the car’s components, graphs, charts, and equations have been re-investigated by the artist and his own team. the information sets now move in time to an ambient soundscape as the most recent research for the newest civic dances across the screen in an intro and three distinct movements. the twelve-minute film loop is displayed in the MUMA (kraftwerk) warehouse art space in berlin, germany. in order to develop ‘data.anatomy [civic]’, ryoji ikeda spent one year poring over the information pertaining to the development of the car. he was given the computer aided design (CAD) data, which detailed every component of the vehicle. it was through this compilation of data that ikeda and his team were able to craft a visual exploration of the inner workings of honda’s engineering philosophy in action. ikeda, assisted by a team of five technicians, analyzed the information supplied by honda in order to develop ‘data.anatomy [civic]’ in both his paris and tokyo studios. the artist’s comprehension of the expansive data set allowed him and the researchers to create an abstracted automobile, understood as not the blueprints for an object, but an experiential installation. the installation is driven by five apple computers which channel information into three projectiondesign F32 projectors outfitted with WUXGA resolution in order to portray the meticulous detail of each piece of the civic’s reinterpreted construction information. data.anatomy [civic]’s clarity when portraying honda’s data set in shades of white, grey and black with red accents is made bright by a contrast ratio of 7,500:1 and luminosity measured up to 8,000 lumens.